The last few years for AMD have revealed an incredible roadmap of new products showcasing innovation and driving excitement across the entire AMD portfolio. 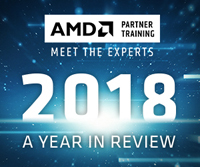 Check out this retrospective from Darren Grasby, SVP of Global Computing & Graphics Sales and President of AMD EMEA as he looks back on a great year, and what’s to come. Watch AMD CMO, John Taylor, and AMD Global VP of Marketing, Ron Myers, look back on a year filled with innovation, achievements, and contemplate what lies ahead in 2019. AMD Radeon™ Software Adrenalin 2019 Edition makes it easy for users to optimize games, control a GPU, and stream from a PC to mobile devices and VR headsets.